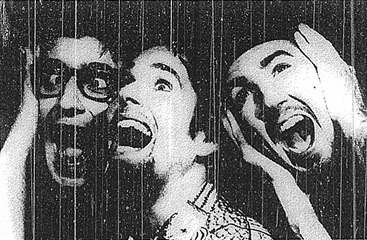 VOICE FARM: Pictured, from left, Ken Weller, Charly Brown, and Myke Reilly. With the single "Free Love," Morgan Creek recording trio Voice Farm has begun to successfully bring '60s-influenced/beach party music back into the clubs. The track is quickly striding up Billboard's Club Play chart, advancing to No. 22 three weeks after its debut. The quirky San Francisco-based group's recently released album "Bigger Cooler Weirder," has already been well-received by club DJs and other critics for its mixture of psychedelic pop melodies, hip-hop-influenced dance beats, and humorous and clever lyrics. The history of Voice Farm can be traced back to the chance meeting of Charly Brown, an artist and musician from Portland, Ore., and Myke Reilly, who served a three month prison sentence in Berlin for experimenting with pirate television there. The circle was complete when former baseball player Ken Weller was added. Regional alternative radio and club play was sparked by a pair of albums released by Ralph and Systematic Records. The group earned national attention last year as the opening act on Depeche Mode's U.S. concert tour.